For the campaign of the American Revolutionary War, see Southern theater of the American Revolutionary War. For the historic site, see Bennett Place. The Campaign of the Carolinas (January 1 – April 26, 1865), also known as the Carolinas Campaign, was the final campaign conducted by the United States Army (Union Army) against the Confederate States Army in the Western Theater. [a] On January 1st, Union Maj. Gen. William T. Sherman advanced north from Savannah, Georgia, through the Carolinas, with the intention of linking up with Union forces in Virginia. The defeat of Confederate Gen. Joseph E. Johnston's army at the Battle of Bentonville, and its unconditional surrender to Union forces on April 26, 1865, effectively ended the American Civil War. After Sherman captured Savannah, the culmination of his march to the sea, he was ordered by Union Army general-in-chief Lt. Gen. Ulysses S. Grant to embark his army on ships to reinforce the Army of the Potomac and the Army of the James in Virginia, where Grant was bogged down in the Siege of Petersburg against Confederate General Robert E. Lee. Sherman had bigger things in mind. He predicted on January 5, 1865: "I do think that in the several grand epochs of this war, my name will have a prominent part." He persuaded Grant that he should march north through the Carolinas instead, destroying everything of military value along the way, similar to his March to the Sea through Georgia. Sherman was particularly interested in targeting South Carolina, as the first state to secede from the Union, for the effect it would have on Southern morale. Sherman's opponents on the Confederate side had considerably fewer men. The primary force in the Carolinas was the battered Army of Tennessee, again under the command of Gen. Joseph E. Johnston (who had been relieved of duty by Confederate President Jefferson Davis during the Atlanta Campaign against Sherman). His strength was recorded in mid-March at 9,513 and 15,188 by mid-April. The army was organized into three corps, commanded by Lt. Gen. William J. Hardee, Lt. Gen. Alexander P. Stewart, and Lt. Gen. Stephen D. Lee. Also in the Carolinas were cavalry forces from the division of Maj. Gen. Wade Hampton and a small number in Wilmington, North Carolina, under Gen. Braxton Bragg. Sherman's plan was to bypass the minor Confederate troop concentrations at Augusta, Georgia, and Charleston, South Carolina, and reach Goldsboro, North Carolina, by March 15. As with his Georgia operations, Sherman marched his armies in multiple directions simultaneously, confusing the scattered Confederate defenders as to his first true objective, which was the state capital of Columbia, South Carolina. Lithograph of Howard's Corps of Sherman's Army crossing the Edisto during the Carolinas Campaign from 1872 children's textbook. On February 17, Columbia, SC, surrendered to Sherman, and Hampton's cavalry retreated from the city. Union forces were overwhelmed by throngs of liberated Federal prisoners and emancipated slaves. Many soldiers took advantage of ample supplies of liquor in the city and began to drink. Fires began in the city, and high winds spread the flames across a wide area. Most of the central city was destroyed, and the city's fire companies found it difficult to operate in conjunction with the invading Union army, many of whom were also trying to put out the fire. 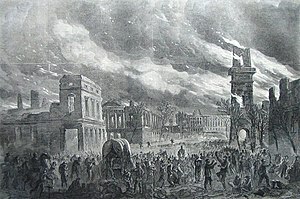 The burning of Columbia has engendered controversy ever since, with some claiming the fires were accidental, others stating they were a deliberate act of vengeance as in Atlanta, and others claiming that the fires were set by retreating Confederate soldiers who lit bales of cotton on their way out of town. On that same day, the Confederates evacuated Charleston. On February 18, Sherman's forces destroyed virtually anything of military value in Columbia, including railroad depots, warehouses, arsenals, and machine shops. On February 22, Wilmington, NC surrendered. Schofield planned to advance inland from Wilmington, NC, in February. At the same time, he assigned Maj. Gen. Jacob D. Cox to direct Union forces from New Bern toward Goldsboro. On March 7, Cox's advance was stopped by divisions under Gen. Braxton Bragg's command at Southwest Creek south of Kinston, North Carolina. On March 8, the Confederates attempted to seize the initiative by attacking the Union flanks. After initial success, their attacks stalled because of faulty communications. On March 9, the Union forces were reinforced and beat back Bragg's renewed attacks on March 10 after heavy fighting. Bragg withdrew across the Neuse River and was unable to prevent the fall of Kinston on March 14. On April 18, three days after the assassination of President Abraham Lincoln, Johnston signed an armistice with Sherman at Bennett Place, a farmhouse near Durham Station. Sherman got himself into political hot water by offering terms of surrender to Johnston that encompassed political issues as well as military, without authorization from General Grant or the United States government. The confusion on this issue lasted until April 26, when Johnston agreed to purely military terms and formally surrendered his army and all Confederate forces in the Carolinas, Georgia, and Florida. It was the second significant surrender that month. On April 9, Robert E. Lee had surrendered the Army of Northern Virginia at Appomattox Court House. It was the virtual end for the Confederacy, although some smaller forces held out, particularly in the Trans-Mississippi region, into the summer. ^ Although the campaign took place entirely in states on the Eastern Seaboard of the United States, it is considered part of the Western Theater because it was a continuation of an offensive by the western armies under Maj. Gen. Sherman (the Military Division of the Mississippi), starting in Tennessee in the previous year. Moore, Mark A., with Jessica A. Bandel and Michael Hill. 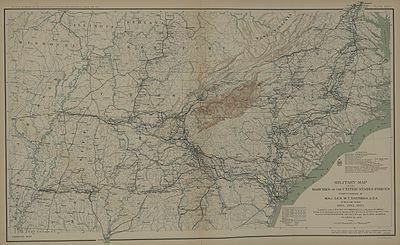 The Old North State at War: The North Carolina Civil War Atlas. Raleigh: North Carolina Department of Cultural Resources, Office of Archives and History, 2015. ISBN 978-0-86526-471-7. Smith, Mark A., and Wade Sokolosky. No Such Army Since the Days of Julius Caesar: Sherman's Carolinas Campaign from Fayetteville to Averasboro, March 1865, rev. ed. El Dorado Hills, CA: Savas Beatie, 2017. ISBN 978-1-61121-286-0. First published 2006 by Ironclad Publishing.